Thanks to the Fair Credit Reporting Act (FCRA), consumers have the right not only to view their credit reports, but to take action if information on those reports is inaccurate or unsubstantiated. Often referred to as credit repair, this process allows you to take control of your credit report and dispute unfair accounts. For many, the easiest way to benefit from credit repair is by hiring an experienced credit repair company to act on their behalf. Unfortunately, it can be hard to figure out which company to trust with your credit — and your cash. Given that the consumer credit industry is heavily watched and regulated by a number of bodies, one of the first indicators of a company that operates by-the-book is endurance. For a company to have reached its 20th year in the industry implies a certain level of commitment to staying within the rules that can be comforting to many. More than that, however, CreditRepair.com’s two decades of credit repair represents extensive experience that can be put to use helping you deal with your credit report problems. In fact, a study of CreditReport.com clients saw an average of 11.6 removals across their three credit reports. Perhaps one of the biggest draws of CreditRepair.com’s services is the simple, flat-rate pricing. The company charges every client a single monthly rate for its services, with no long-term contracts or obligations. And while you’ll pay a one-time fee for the initial obtention of your credit reports, the company won’t charge any hidden fees. And before you even get started in the program, you’ll receive a lot of freebies, starting with your free, personalized credit consultation. You’ll also get free access to your credit report summary, an audit on all of your accounts, and a free credit score evaluation, complete with recommended solutions. Additionally, CreditRepair.com makes it easy to access your account and check on your credit repair process at any time. You can log into your personal online dashboard 24/7, as well as access your information on the go with the mobile application, which works on Android and iOS devices. The credit score tracker and analysis can help you stay on the right path, and clients can even set up text and email alerts to ensure their report stays in top shape. CreditRepair.com tries to maintain a transparent process, laying out on its website exactly what clients should expect from the company’s three-step credit repair process. Visitors can also find a wide variety of credit education resources, including articles and guides on everything from improving your credit to dealing with identity theft. Of course, while you’re welcome to take our word for it, all good financial due diligence should involve seeking out a variety of opinions for the best results. Thankfully, the internet has opinions to spare. In fact, CreditRepair.com’s website has dozens of customer reviews, including a variety of video testimonials from real clients. And on BestCompany.com, you can find more than 380 CreditRepair.com reviews from clients across the country — reviews which add up to a solid 8.2 user score. The general consensus? Clients love the knowledgeable staff and positive results. As with just about any business, however, it’s not all rainbows and happy trees in CreditRepair.com’s reviews. The majority of the negative reviews are from customers who didn’t see the progress they hoped, with most complaining that the process took too long or didn’t improve their score as much as they anticipated. Despite being clear on the fees it charges, a number of reviewers are also unhappy about the cost of the service. And similar to most services based on subscription payments, a number of the complaints center on the service being difficult (i.e., involve a long phone call) to cancel. By reading the reviews, it’s clear that a big part of finding success in the credit repair process is to know what to expect before you get started. 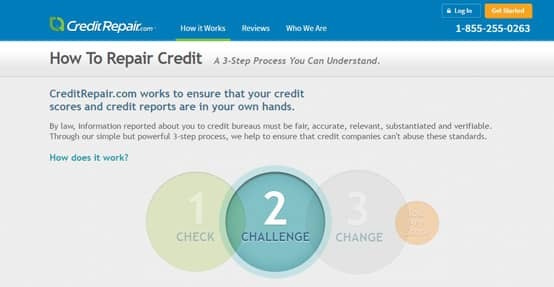 At CreditRepair.com, the team uses a three-step process to address each client’s overall credit situation. It all starts with step one, the Check. When you sign up, your representative pulls all three of your credit reports and organizes the information to enable you to identify the items you’d like to dispute. With information on your credit situation and goals, the team determines a personalized game plan to fix your credit. CreditRepair.com follows a three-step process to address your credit report concerns. With a plan of action, the next step is the Challenge. During this step, CreditRepair.com initiates an ongoing conversation between the client, the creditor, and the credit reporting bureau. The company’s experts communicate directly with each party to address issues, as well as staying in contact to ensure agreed-upon changes have actually been made to your reports. And finally comes Change. On average, CreditRepair.com clients see 7% of the negative items on their credit reports removed each month. Additionally, CreditRepair.com aims to have an enduring positive impact on your credit health that extends beyond your time with them, providing credit score monitoring and educational resources to help you stay on track. Credit repair can be a simple way to remove mistaken, out-dated, or unsubstantiated information from your credit report, and the credit repair process can be an effective way to improve your credit score. The typical CreditRepair.com client, for example, experienced an average credit score increase of 40 points over the course of four months of service. The key thing to keep in mind when considering credit repair, regardless of which company you select, is that the process is very individualized. The actual results, including how long the process takes and the number of points your score increases, can vary significantly based on your specific circumstances.